Dejaco, Eggeling, Ertl, Janisch, Jothann, Kastner, Kirschneck, Peetz, Pollok, Schenk, Semena [? 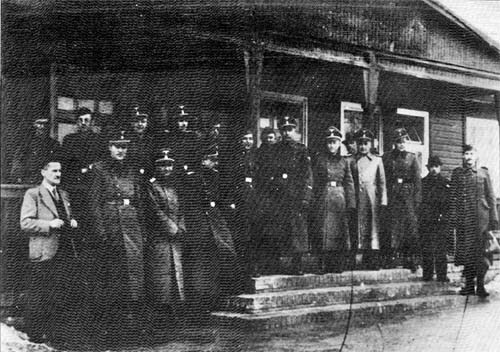 ], Töfferl, Urbanczyk (first Head of the Auschwitz Bauleitung before Bischoff arrived on 1st October 1941), Wallerang and Wolter. 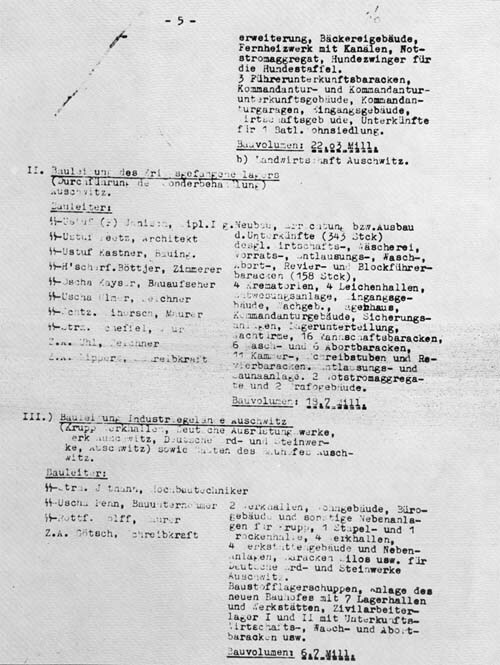 Those whose names are underlined participated in various ways in the construction of the four Birkenau Krematorien, but the others were all perfectly well aware of their “abnormal” purpose (in a list showing the allocation of work covering the whole camp among the members of the Bauleitung, there appears in brackets under the heading of section II “Bauleitung des Kreigsgefangenenlagers” the explanation “(Durchführung der Sonderbehandlung / Implementation of special treatment” [Photo 2]. This list was circulated to everybody. Fifth page of a six page document listed the allocation of work at the main camp and Birkenau between the members of the Bauleitung. Undated, but probably drawn up in March or April 1942. From the “October Revolution” Central State archives in Moscow.